Take reusable bags with you at all times. Keep them in your car, in your handbag etc, then you’ll never be tempted to buy plastic bags. Buying a Bag For Life really just means even thicker plastic bags are produced. Recycle your plastic bags (any bags with stretch to them, like bread bags, chip bags etc too) at larger supermarkets and through your delivery person too if you use one. Buy a reusable water bottle to take out with you. Plastic bottles are harmful to health and not enough of them get recycled. 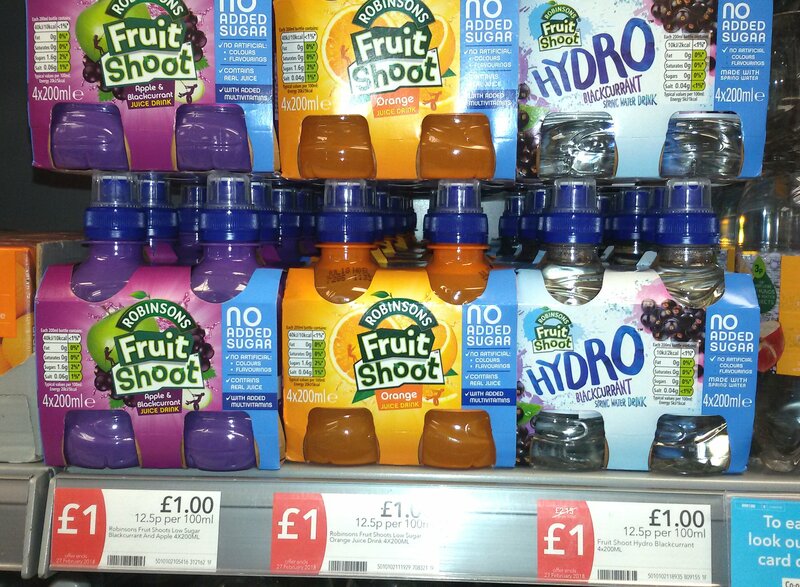 Get the children a funky (non plastic, non BPA) water bottle and take that out with them rather than buying horrendous Fruit Shoots chemical rubbish that have those little lids on them that were ALL OVER THE BEACH last year! 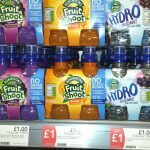 We could do without our local supermarkets putting them on offer too please Co-Op! Get yourself a reusable coffee cup if you like your lattés! Take it with you when you go to Waitrose or Costa etc for a takeaway. Coffee cups are not ordinarily recyclable and the plastic lids get everywhere (except at cafés like the Dairy Shop or the Filling Station – both of whom sell lovely reusable coffee cups made of sustainable materials – not plastic). Refuse straws! Do you or your children really need one? Catch the bartender or waiting staff before they reach for one automatically. There is no place for plastic cutlery in this world. Take your own with you, or eat at takeaway places that give out wooden cutlery (like The Filling Station for example – perfect!) That includes ice cream spoons, plastic stirrers, etc. We don’t need so many bottles in our houses. Reduce the number of shampoos, cleaning products, liquid soaps you buy – go back to old school soap, consider an EcoEgg for washing, or refill at your Ecover washing liquid etc at Ganesha. If you must buy plastic bottles, try and buy the ones with the lightest colour – for example black plastic cannot be recycled. Every single toothbrush that has ever been made is still in existence somewhere. Bamboo toothbrushes are now available – find them online (and hopefully they’ll be stocked locally soon). As a last resort, after refusing and reducing, ensure you recycle everything you can. We have a huge amount we can recycle in East Devon, we are very lucky – but we must use it. Also, ensure your bins are secure as a windy day can cause plastic to be strewn over a large area. 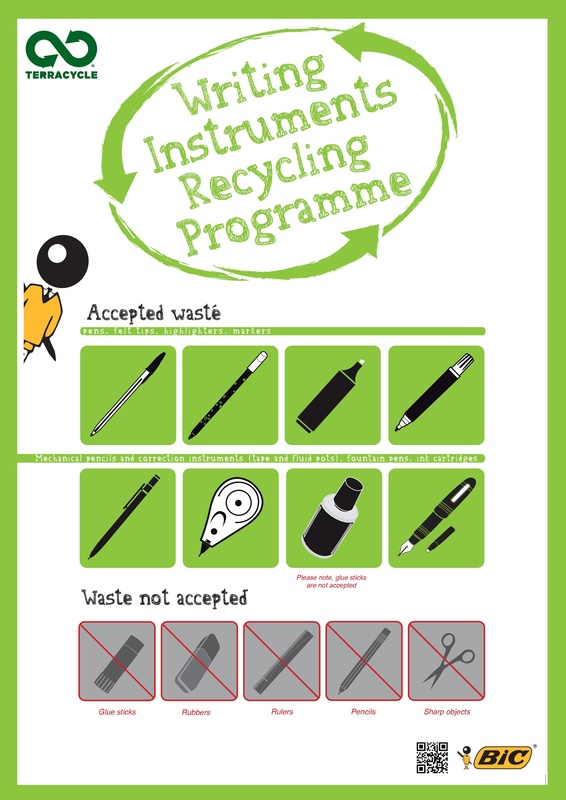 Sidmouth Primary School are now a registered local collector for disused pens etc as part of TerraCycle UK’s Pen Programme – start collecting them band when you have a load bring them to one of the schools or I can collect them if there are hundreds! Maybe you could set up a collection box at your work so that NONE go int the bin any more? 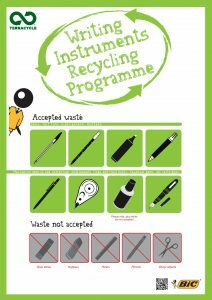 Sidmouth Primary School will benefit financially from us recycling as many pens, felt tips, tippex bottles etc as we can. Also we are collecting biscuit wrappers (any sweet biscuit brand including multipacks like Penguins for example). Let me know when you’ve got a substantial amount and I’ll get them from you to pass on to Jen who is collecting them to benefit a local juvenile diabetes charity (details to follow). Get active. If you see a product that is ridiculously packaged, get on Social Media to the company and use the hashtag #plasticpollution to share it. This definitely is working – for example, all the major retailers are now scrambling to be the first to sell plastic-free teabags (yes, they contain plastic). Ask your favourite takeaway place to use bottles of sauce, not little sachets (plastic), and to change their packaging if they are still using styrofoam or plastic containers. If they value you as a customer they will listen and there are plenty of alternatives available now. Finally send us any other tips you’ve got, suppliers for great products you’ve found etc and I will update this list! Thanks.